One of the most popular floor plans with large private outdoor space. One of the last remaining units with such a huge patio. Compare to anything else under $300k and the difference is clear! Situated steps from Stapleton Town Center, Moda was developed by Infinity Homes, a name synonymous with high-end homes throughout Colorado and built by Swinerton. The interior finishes include a calculated palette that places an emphasis on craftsmanship and design. Features include granite counters, stainless appliances, new hardwoods, and flat-panel cabinetry. 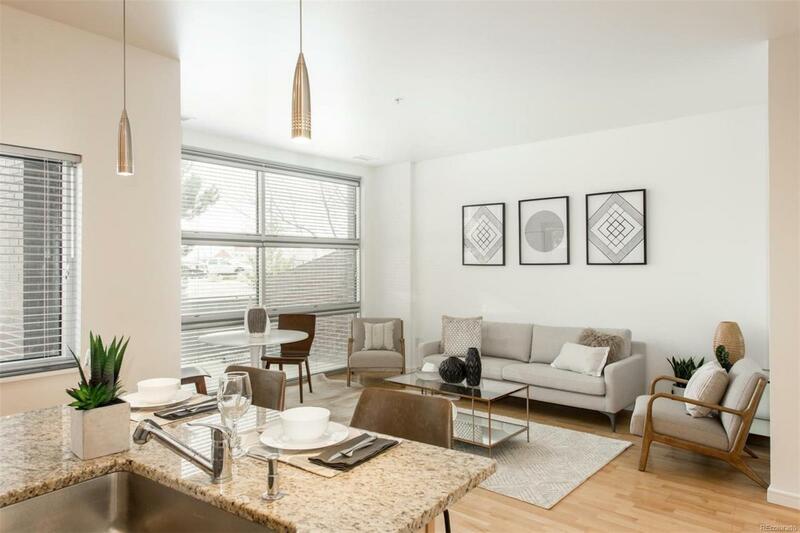 Every residence includes floor-to-ceiling windows with abundant natural light, and each unit comes with a deeded secure underground parking spot and storage unit. In the master bedroom, form meets function with frameless shower doors, soaking tubs, and walk-in closets. Centrally located within Stapleton, MODA Lofts offer convenient access to the best retail, dining, parks, and rec centers around Denver.